MR Online | Why don’t the media fact-check “amnesty” claims? Anti-immigrant pundits like Ann Coulter were attacking the president because he appeared to be offering to extend DACA protection for three years. They took to the airwaves and social media to denounce any DACA extension as an “amnesty.” “No, Amnesty is not a part of my offer,” Trump tweeted back, and for once he was right. Amnesties have been recognized at least since the fifth century BCE as a tool available to governments seeking to bring excluded classes of people into the political community. Examples in U.S. history include Lincoln’s 1863 Proclamation of Amnesty and Reconstruction and Carter’s 1977 blanket pardon for men who had evaded the draft during the Vietnam War. So how did the word get to be an insult in the 21st century? is that they beget more illegal immigration. Demographers trace the doubling of the number of Mexican immigrants since 1990 in part to the amnesty of the 1980’s. 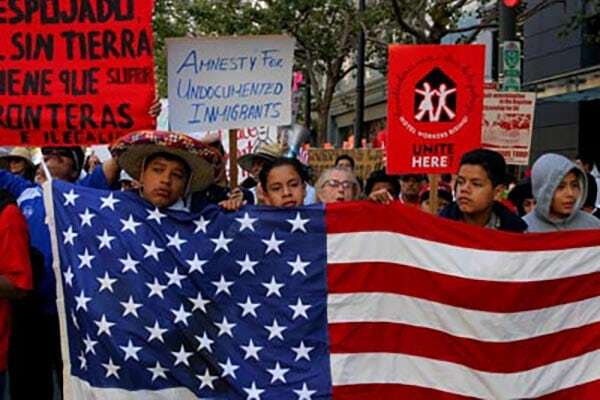 Amnesties signal foreign workers that American citizenship can be had by sneaking across the border, or staying beyond the term of one’s visa, and hiding out until Congress passes the next amnesty. But there’s no evidence for this claim. Social scientists like to note that correlation doesn’t imply causation; in this case there isn’t even correlation. Look, for example, at apprehensions along the southwestern border; demographers often use these as a very rough indication of unauthorized immigration flows. The Border Patrol’s apprehension reports suggest a fairly steady increase in unauthorized border crossings from the early 1970s until 2000, and then a decline back to the levels of the early 1970s. There was an uptick in 1986 as Congress was considering that year’s amnesty, but then a small decline after the legislation actually went into effect. The greatest number of apprehensions didn’t come until the middle and late 1990s.This followed a series of neoliberal reforms instituted by successive Mexican governments in the 1980s and early 1990s, the implementation of NAFTA in early 1994, and a major economic crisis in Mexico starting at the end of that year. The increase coincided with a period when the U.S. economy was comparatively strong. If the rise in border apprehensions correlated with anything, it was with economic conditions in Mexico and the United States, not with the 1986 amnesty. In fact, contrary to the Times editorial, demographers haven’t found that the amnesty had any long-run effect on patterns of unauthorized immigration. Even a report in 2000 by the Immigration and Naturalization Service—the agency that handled immigration enforcement until 2003—couldn’t establish that the 1986 law triggered the rise in unauthorized border crossings in the 1990s. And two surveys of undocumented immigrants suggest that the 1986 amnesty had little or no influence on their decisions to come here. If there’s no evidence that “amnesties beget more illegal immigration,” then why do people continue to believe it? One important factor is obvious: the media don’t fact-check the claim. The Times may no longer editorialize against amnesty, but its news articles still don’t challenge right wing talking points about it. After Trump made his apparent offer to extend DACA, the paper quoted James Carafano, a national security expert at the right wing Heritage Foundation. “Amnesty encourages further illegal immigration, incentivizes the tragedy of human trafficking and undermines our citizens’ confidence in the rule of law,” he told the Times reporters, who quoted him without comment. There are now about 11 million people here living in the limbo of undocumented status; about two-thirds of them have been residents for a decade or more. The situation is painful for them and for the millions of U.S. citizens in their families and communities. A new general amnesty should be a top priority on the political agenda. There is no excuse for the media to go on letting rightwingers hold it hostage with evidence-free assertions.